Over the holidays, I saw a beautiful helleborus plant and decided to bring it home. 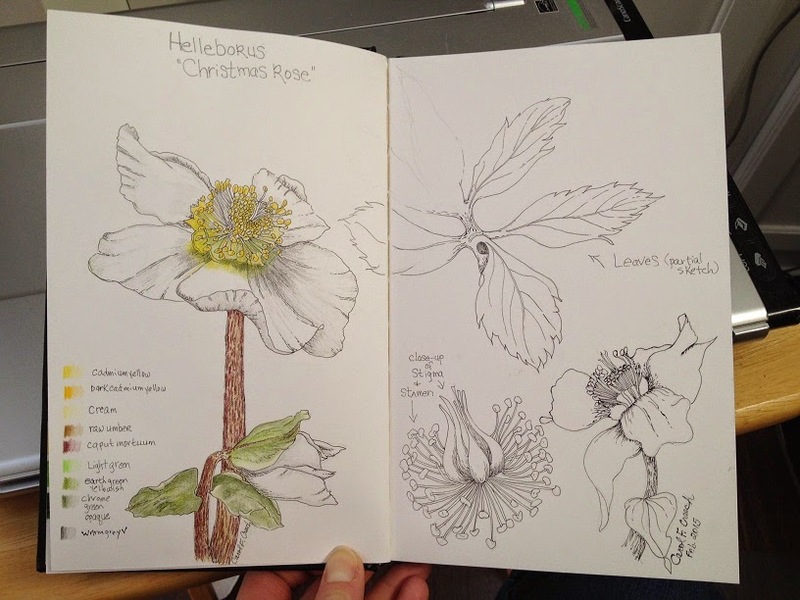 Despite being called the Christmas Rose or Lenten Rose, hellebores are not closely related to the rose family. Instead, they are an evergreen perennial flowering plant in the family Ranunculaceae. This particular plant had beautiful, creamy white blossoms with a tight cluster of stamens in the center that open up as the bud flowers. With thick stems that have a red/brown markings and large, serrated leaves, they make a striking addition to the table. I thought it would make a great subject for my next sketchbook entry. I started with some rough graphite sketches to get a sense of the shapes of both open petals and buds. I did a little bit of sketching of the leaves as well. The biggest challenge, though, was the center of each blossom with up to 150 stamen surrounding the pistil. I still love the combination of ink and colored pencil, so I went over my initial pencil sketches with a 3×0 (.25) technical pen, adding some details here and there. Then I also used my Faber-Castell Polychromos colored pencils to add color to the page on the left. I think the page turned out well. I am currently looking for a subject for the sketchbook that I have on my desk. Wish me luck! Previous Sketchbook Exchange Update – Drawing #5! Next Sketchbook Exchange – Drawings #6 and #7 and my own book back! I love your sketchbook entries. I saw the one in Traudl's book recently…. stunning! Very lovely blog post, Carol. I like your process of first doing several studies in graphite before tackling the color. Nice work.